The Monster Bash 2013 featured Guests of Honor Ron Chaney, Donnie Dunagan, Janet Ann Gallow, Butch Patrick, The Shemp Howard Family, Pat Priest, Gregg Palmer, John Saxon, Robert Dix, Veronica Carlson, Eternally Elvis, The Abbott & Costello UltimAte Tribute Show, Tom Savini, John Russo, George Kosana, Kyra Schon, Cortlandt Hull, Chilly Billy Cardille, David "The Rock Nelson," Son of Ghoul, Count Gor De Vol, Mr. Lobo, and many others! Photos provided by Karl Spisak and family, Malcolm Gittins, Phil Smooth, Cortlandt Hull, Sandy Castle and others - thank you! 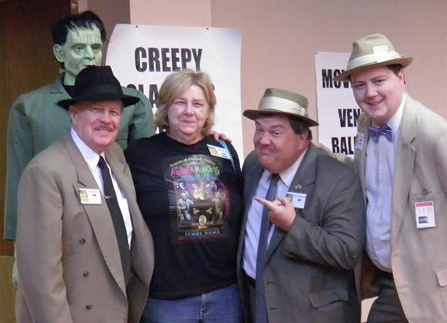 "The Boys" meet attendee Cathy Spisak! 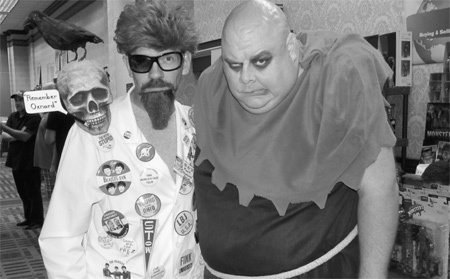 Creighton of Ghoul A Go-Go and Mr. Lobo on stage with madcap fun for Monster Bash. 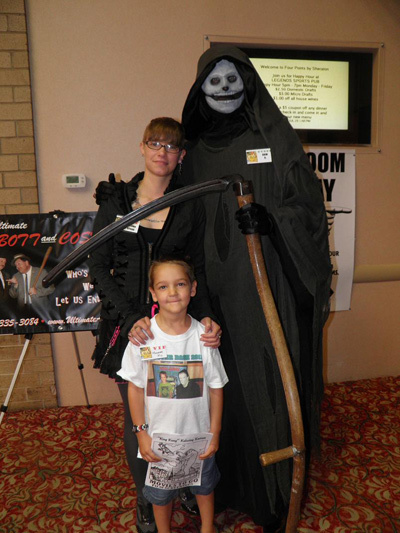 Things get a bit "Grim" with Autumn and Hollis at Bash. 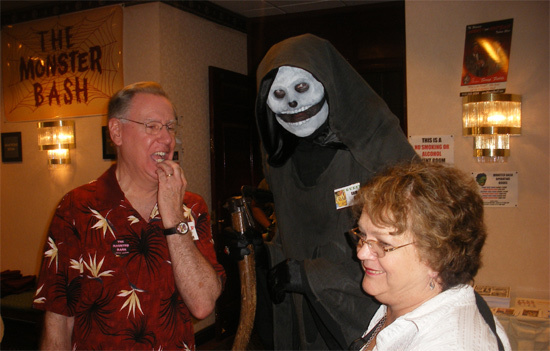 Attendee Autumn Spisak meets Ron Chaney. 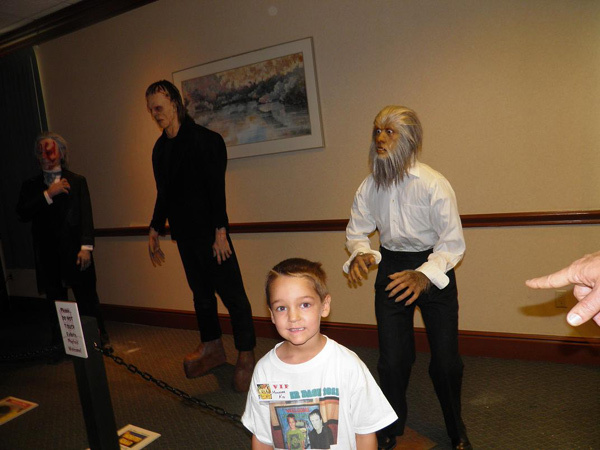 Young Monster Kid Hollis gets to hang with some favorite friends! Everyone's a kid again at Bash....Hollis and Karl Spisak. Watch out for that werewolf! Grandpa (Ted Lewczyk) puts the bite on Autumn Spisak...Herman (Thom Shubila) is mighty proud. 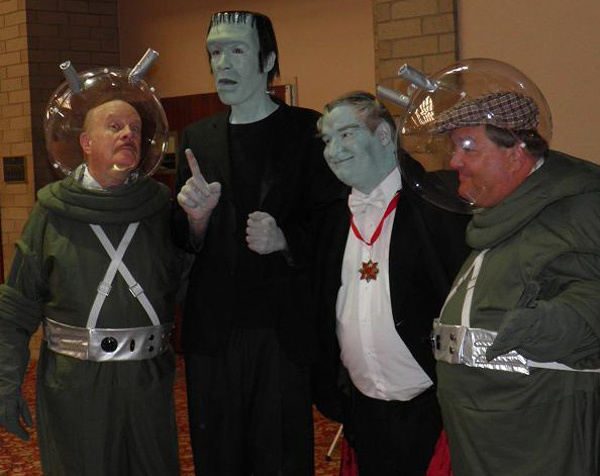 Only at Monster Bash do Abbott & Costello Meet the Munsters. "Flowers for me??!!" 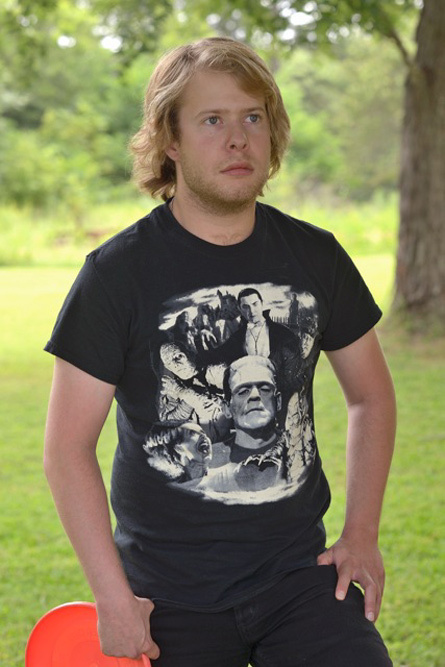 Lou Costello looks jealous in the background. 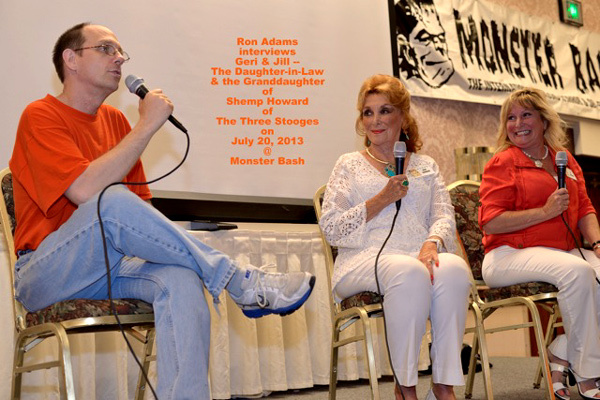 Ron Adams interviewing Shemp Howard's daughter-in-law, Geri Howard and Shemp's granddaughter, Jill! Monster Bash attendee Dalton Smoot takes an after-Bash break with his new shirt and a "Monster Bash Orange" flying disc (from Roswell?). 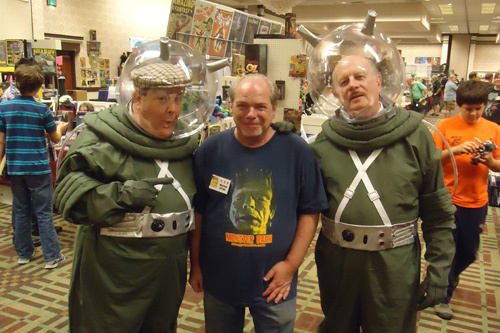 The Ultimate Abbott & Costello Tribute Team of Joe & Bill with Malcolm Gittins in between! 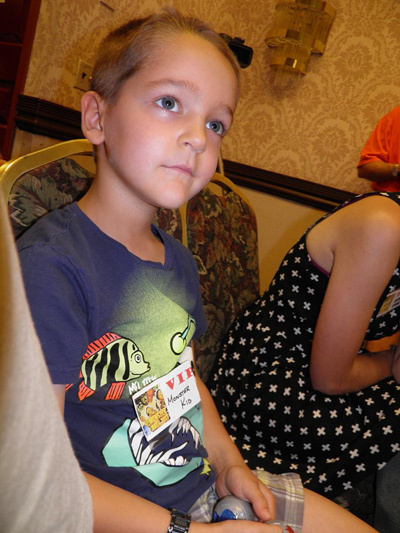 It was MONSTER BASH Summer 2013! 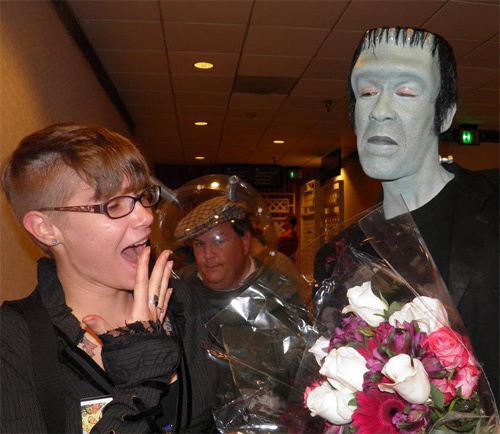 Looks like Chaney has the bite on Malcolm Gittins! 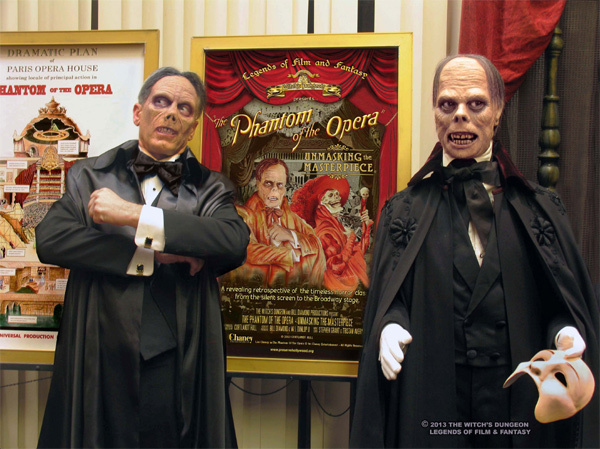 The Phantom is Ron Chaney, great-grandson of Lon Chaney, Sr.! In make-up by John Tattarelli and The Reel Magik Team. 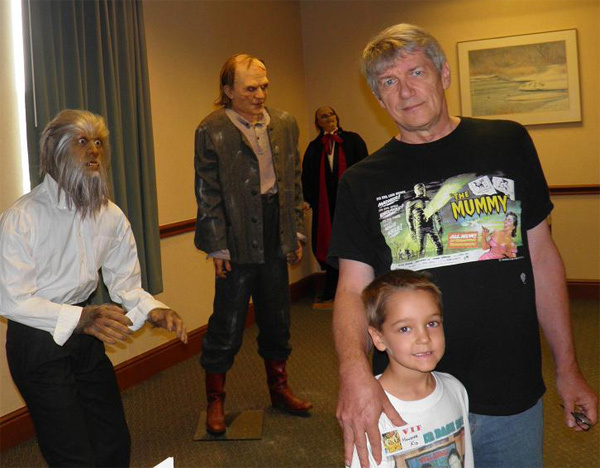 Ron Chaney along with his great grandfather's image at The Witch's Dungeon booth, Monster Bash 2013! Photo by Cortlandt Hull, make-up by John Tatarelli, Jr. and Jesse Melchoir and the Reel Magik Team! 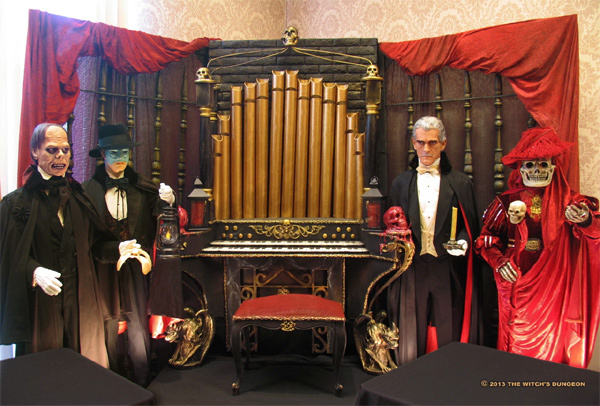 Here's the great display from Cortlandt Hull and The Witch's Dungeon at Bash! Wowza. 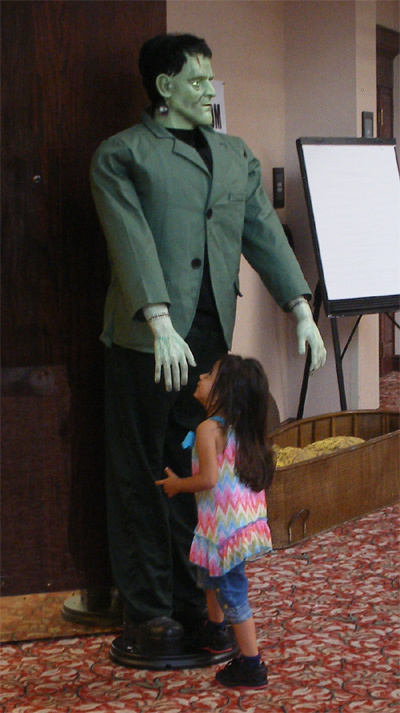 Monster Kid attendee, Gabriela, meets Frankenstein. 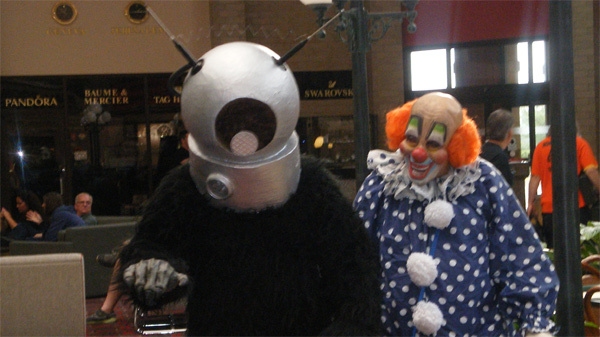 An unlikely duo - Robot Monster and a Smiley Clown. The clown was definately scarier. 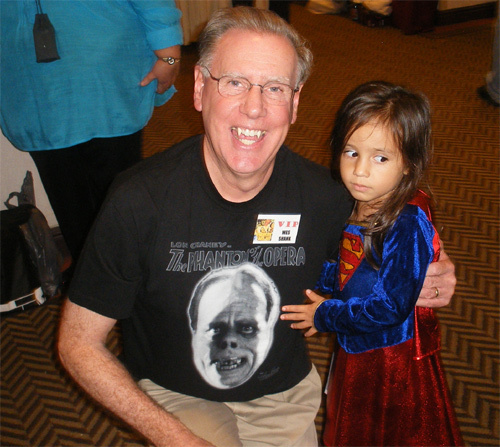 Blob book author and historian, Wes Shank, meets a young fan. 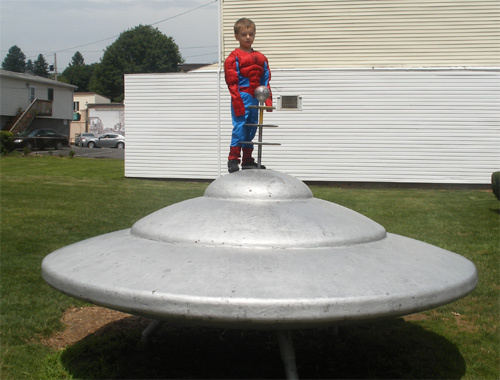 Spider-Man (played by Korbin) lands in Mars, PA for Monster Bash! 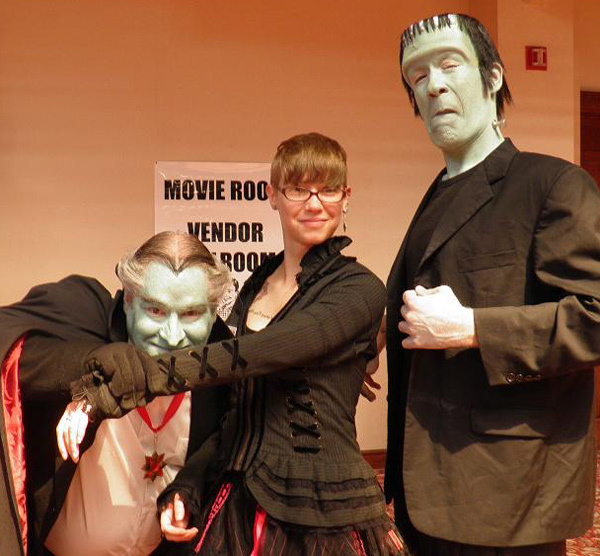 Wes Shank, Judi & Grim do the Bash! 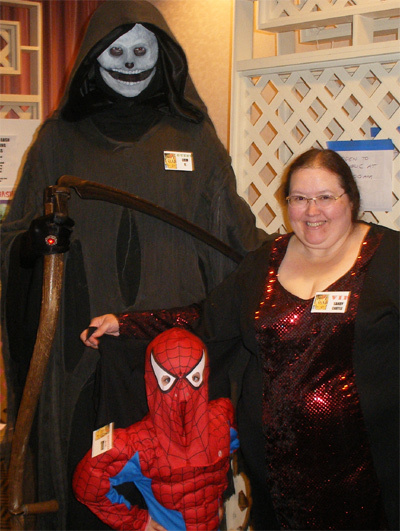 Bash's resident Grim Reaper with Korbin and Sandy Castle. 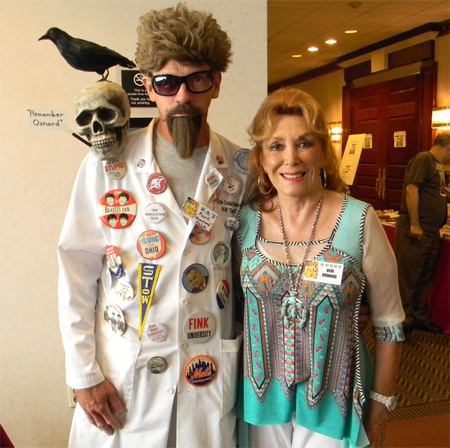 Attendee Mark Hale (dressed as TV Horror Host Ghoulardi) with Geri Howard (Shemp's daughter-in-law). 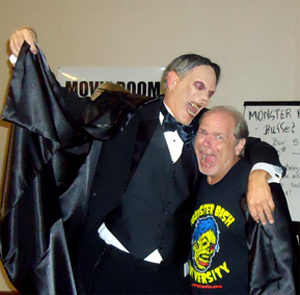 Mark Hale (dressed as TV Horror Host Ghoulardi) with Baltimore Horror Host Legend, Count Gore DeVol, together haunt the Dealer Ballroom at Monster Bash! Mark Hale gets around! 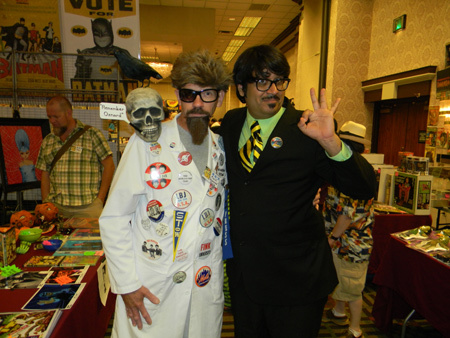 Here he's hanging out like a vampire bat with TV horror host, Mr. Lobo. 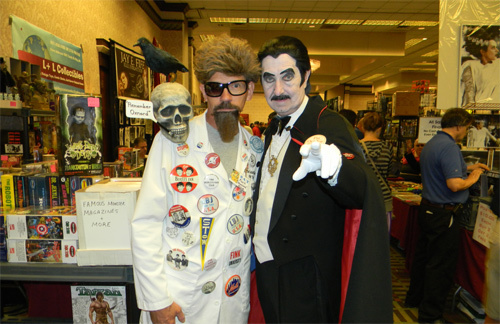 Mark Hale doesn't want toleave any horror hosts out, here he is with Creighton of Ghoul A Go-Go!